British violinist Tasmin Little has faith in classical music – that the music itself needs no dressing up to appeal to people across a wide spectrum. She's done her best to prove it, as well. In February 2008 she released an album of all solo violin works called The Naked Violin, in the form of a free download. Her idea was to bring violin music to an audience that might not otherwise find it accessible. To make it even more accessible, she created audio introductions to the pieces, and challenged people to download the music, get to know it well, and then write her if they still felt a barrier to enjoying classical music. Her new album, Partners in Time, was conceived along the same lines, and though it is not free this time, Tasmin has created the same kinds of educational features on her website to lure the uninitiated – and also to offer insights for those of us who already love this music. Tasmin, who is 43, has reached out in live performance as well. In addition to regular concertizing, she also has been performing monthly at schools, and even at prisons. Tasmin, who plays a 1757 Guadagnini violin and also has the 'Regent' Stradivarius of 1708 on loan from the Royal Academy of Music, talked with Violinist.com last month while she was in Seattle to play the Elgar Violin Concerto. 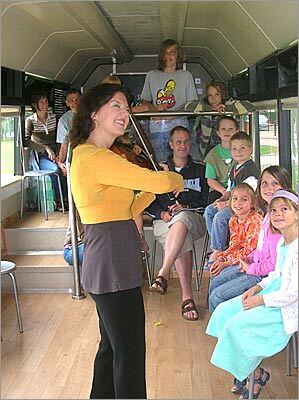 She spoke about her early days at the Menuhin School, about her Josh Bell-like busking experiment in London several years back, and about her new mission to bring classical music to the widest possible audience. Laurie: Let me start at the very beginning: what made you want to start playing the violin? Tasmin: Actually my route into playing the violin was slightly unusual, though I grew up with a concept of performing because my father (George Little) is an actor. He didn't do a "normal" job either! So my sister and I were taken off to the theatre regularly as a part of our childhood. My parents also loved classical music, so they used to play a lot of records, in the days when there were black vinyl records. My father was in a lot of musicals, so there was a lot of music in the house, of all different types. When I was six, nearly seven, I was couped up in bed with chickenpox, and I was so incredibly bored. I knew some of my friends were learning recorder at school. so I asked my mom, would she be able to buy me a recorder and a book? Then I promised I wouldn't nag her any more to play games with me. So she bought me a recorder, and she bought me a book, and I actually taught myself to play the recorder and read music in a half an hour. I really loved it, and it was incredibly easy. So I thought it would be lovely to play another instrument. At the same time, we had just met a young piano student who had just graduated, so my sister and I took piano lessons. By this time, I also was getting very interested in the violin. When at last I picked up the violin, I just knew instantly that that was the instrument that I loved. I made very quick progress on 15 minutes a week, which was all that you were supposed to get at the school. But after three months I was playing in my first concert, and then about six months later my teacher said, "Look, you really need to go to a specialist music school." So I auditioned for the Yehudi Menuhin School and I got in. I'd been learning just over a year, and I went. Laurie: How old were you, then, when you went to the Menuhin school? Tasmin: I was just eight. It was quite young, bearing in mind that it's a boarding school. I effectively left home at age eight. But it was a very small school as well. At the time that I arrived, there were only 35 pupils, ranging from age eight to 18. I had only about three people who were actually my age in the whole school, which was a bit bizarre. It was a wonderful education, a fantastic atmosphere in the school. It was more like a family, really, but it was a big adjustment, having been in a large primary school in the heart of London. Suddenly I was right in the middle of nowhere, in this stunningly beautiful countryside, with lots and lots of fantastic, young players. Laurie: Did you see much of Menuhin, then? Tasmin: He was amazing. He was very active, still performing at that point – this was 1973. He was playing, he was conducting, he was doing all sorts of things. Bearing in mind the fact that he probably spend only about 40 days in England in one year, he would spend three of them down at the school. He would come at least three times a year, and he would hear every one of us. Laurie: I've always been curious about that school. Tasmin: It's a wonderful school. There were so many not-very-nice rumors that used to go about, like what a hothouse it was, and how we were drilled like little machines, and how people were not really given proper academics education, and so what you got were these robots who just can play fantastically well... nothing could be further from the truth. The moment I arrived at the school, the two words that were sort of the mantra were "chamber music," and the first thing that happened was that you were put in a quartet and made to listen to everybody when you played. That was just the whole ethos of the school: the idea of being a listening musician. I have to say, I meet quite a lot of musicians who don't listen! Listening is the number one, most crucial element when you are making music with other people. How can you possibly make sense of anything if you're working in a vacuum? Then the performance is in fact nothing to do with the music, or even anything to do with anybody that's listening. It's your own little private world. That's very far from what I believe. Laurie: It's obvious that that's far from what you believe, because you're really reaching out. You've gone to great lengths, actually, putting something out like The Naked Violin, which not only was offered as a free download, but also had all kinds of educational audio introductions on the website... What brought you to this idea, of doing these downloads for free? Tasmin: Various things. It wasn't that I just woke up one day and thought, "Ah, I'm going to do that," it was an evolving process. For many years I have believed that anybody can enjoy classical music, despite the fact that at various points politicians have said, 'Oh no, classical music is for a middle-class, white audience.' Personally, I find that kind of statement insulting – insulting to everybody, actually. But also, it's just not true. So for years I've felt that I would like to do something to make music more widely available, to shake off something of the stuffy image – but not at the expense of the music. I don't disagree with crossover; or quartets such as Bond, dressing up; or Vanessa-Mae doing her stuff – I'm not against that in any way. But I do feel that there is a very strong case to be made for reaching out to a diverse audience and playing classical music, unadulterated – not given a beat, and not dressed up in some other way to distract people from the music. Because when people do other things with the music, it's saying, "We don't think you're really going to enjoy the music as it is, so we'll do something else so that you don't really have to concentrate on the music." I don't want to do that myself. A few things happened during 2007 that gradually led me to put out "The Naked Violin" download: You will remember when Josh Bell did the busking...The Independent Newspaper in England said, 'Ah this was an interesting experiment, would you come and do the same thing? We're curious to see whether the same thing would happen.' It was actually not any more successful than Josh's attempt, certainly from a monetary point of view! Which is fine, because that wasn't the aim of the game. Laurie: Where did you do it? What happened was that I was absolutely surprised and shocked by the people that didn't want to listen, and the people that did want to listen. It was like a concert hall, turned on its head. Of all the people that would probably pay vast sums of money to go regularly to concerts – nobody even looked at me. They just walked straight on past. But the people that were so curious and interested were the young people. Also, there was some building going on nearby, I think at the Festival Hall, and a lot of the workmen stopped. British workmen are quite funny sometimes. They'd throw a line at me, in a very lighthearted fashion, it was great. It was clear that out of the stuffy -- or perceived-stuffy -- environment of the classical concert hall, many people that you wouldn't associate with going to concerts will listen to classical music. I thought, okay, this has got something to do with the environment, that people don't feel comfortable going into a classical concert hall, never mind the expense. So many young children listened – there were two ladies who walked past, and their young children wanted to watch, but they were being hurried away. I presumed that the mother didn't want to give any money, or maybe they had a train to catch, because we were by a train station. Anyway, they literally had to pick one of these children up and carry her away. She wanted to watch me. It was a fascinating experience, it just made me re-think this whole problem that people have often spoken about in classical music: How do we get these audiences? What is it that is preventing very young people from coming into the concert hall? I was thinking quite a lot about that during the year. Then later on in the year, I was playing a fantastic program of totally solo violin works: the Bach G minor sonata, the Paul Patterson, the Bartok Solo Sonata and the Ysaye Ballade. The responses I was getting to this program were unbelievable. Music such as the Bartok Solo Sonata – which some people might consider very difficult listening – was generating this incredible response. Everybody just adored the program. Everywhere I went, this program really seemed to have an effect on people. So I began to put the two ideas together: of wanting to reach people and wanting to play unadorned, wonderful violin music. I wanted to put out a range of very different violin music, instead of doing what is done most of the time on CDs, bracketing works of only one particular style, or just one composer. So the idea was born: I thought, I will record this, and I will make it available as a download – and let's see whether anyone is interested in this kind of classical music, once it's taken away from the usual environment. And the response was quite phenomenal. I was amazed. I was getting 20,000 hits a day on my website. Within literally a couple of weeks I'd had 250,000 visitors from all over the world on my website, and right now we're currently marching toward half a million. And the letters! These letters were so moving, some of them. Tasmin: People did write, they wrote from all over the world, quite often not in English. I speak some languages, so most of the time I could understand what people were writing -- but sometimes I couldn't! Two of the letters I loved the most came from the States. One was from a guy who introduced himself as a 50s-plus rock 'n' roller. He said, 'I never thought I would ever listen to, or love, any other music than rock 'n' roll.' He said, "I've never been interested in classical music, but your playing and your music makes me want to throw away my whole rock 'n' roll collection and replace it with classical CDs." I was so thrilled about that letter, first of all, because of the age of the boy; but also because of the fact that we are so boring and stuck in our ways when we make assumptions about what children will want to listen to. So often people think, Mozart's for children, and sure, Mozart is for children, but so is contemporary music. In a sense, children have got this amazing, open mind, and they don't feel that they have to provide a particular response, they just respond. So I love that letter. Then another that moved me considerably came from a man in Nantong, China. He wrote to say, 'You've got no idea of the value of the gift you have given. In China, we've got no credit cards, so we can't order anything off the Internet.' Of course you and I, we wouldn't even think about that, it's so taken for granted, that you get on the Internet, you order something online, you give a credit card, and that's how transactions are done. So I was absolutely touched by his letter. He said that the opportunity to listen to world-class classical music was so limited for him, and therefore he deeply appreciated my download. So that's just a small flavor of the hundreds of letters that I received. It was genuinely moving, and I still get letters. Laurie: Tell me about your new CD, Partners in Time. I noticed that you provide extensive introductions to your album, and also to each piece, on your website. Tasmin: People now are so interested in the Internet, and that was another reason why I wanted to provide, with my new recording, these facilities for people to explore classical music. I've spent a long time writing these introductions which are on the site, and I've also recorded them, so that people can listen to the introductions – for example, if somebody is visually impaired. You can read them and listen, or you can just listen, or you can just read. There are tons of musical examples as well. Laurie: So your new CD, is not free, like "The Naked Violin" was, right? Tasmin: This one is not free, but what I have done, in addition to making this listening facility available on my site; I recorded a bonus track for download, for people who do buy the CD. I know that it's a leap for people: one moment I'm saying okay, here, have a download, and now I'm saying you've got to pay for it. It's not sustainable to continue to put music out permanently for free. But it's an invitation. I feel that it's so important that musicians continue to find ways of engaging people, of reaching out, of being imaginative in the works that they program and record, and then finding ways of capturing people's imaginations. I'm hoping that the little five-year-old boy is going to go and listen to this CD and say, "Wow, that's great as well," and that he'll find something he'll think is "way gooder" than Bach, or perhaps on this one the Bach will be "way gooder" than everything else...When you reach into different areas and you explore different ways, I think people really respond. "your playing and your music makes me want to throw away my whole rock collection." If I can read just a little into that thought, then there's the problem regular people have with classical music. There's a tacit message that the music they -love- is inferior. That's also the message of the concert hall, I think, and why the slag throwers had an interest at the station, but wouldn't go to a concert hall. In addition, people are fascinated by an instrument played really skillfully, itself, regardless of what's being played. There's a motorcycle mechanic locally, he heads up a racing team actually which includes a world champion in his division, and the local 24/7 classical station is always what's playing in there. I mentioned it once and the said something about the other station, which was a jazz station, changing its format to something else. If you smirk at him for enjoying classical music on his terms, then it's fair for him to smirk at you for driving a car instead of riding a bike. And the guy who wrote the code for your free download can smirk about you not knowing tcp / ip. Until all we got is smirks all around. It's love, not science. The only inferior music is something nobody loves. I admire so much classical musicians like her who want to put classical music to its natural and take it out from this negative snob image it can have in non initiated people! She does her best to show how beautiful it is to everyone and this is great! I hope..... that she will subscribe here and join in the posts! Tasmin Little; A cute Nome' de Plume would be "Little Tas" Too Cool! Violinist like her posting here would be like an online master class! I wish Hahn would post. She has! Here is her V.com page. gosh, i remember when Ms. Little was just a little girl and we were in the BBC competition. Probably wasn`t that long ago. Yep, she did post! Rock On! I heard her world premiere of the violinconcerto of Raaf in Amsterdam. That is one long list, I hadn't seen that page. She also is one of the few who plays the Ligeti V.C. I heard the Ligeti vc in The Concertgebouw, Amsterdam of Frank Peter Zimmerman 2 weeks ago on 2 april. The rest of the programm was also modern, but the musichall was quite good filled for a tuesdayevening execpt for the balconies and the back of the orchestra. The same day I saw between 10-15.00 hours the national violincompetition in the small hall in the same building.